Contact Board Members via links, to their profile pages, next to board position titles. We welcome members to get involved with running the Colorado chapter! If you are interested in filling a Board position, contact any of the Board members. Board terms run from May 15 through May 14 of the following year; voting occurs in March. If you would like to help out by joining a committee or volunteering in any other capacity, click on the name of the board member you would like to connect with. Committee members which need the most help are: Volunteering/Go Month (with Vice President), Marketing (with Marketing Director), Chapter Meetings (with Programming Director), and Membership (with Membership Director). The President supervises the conduct of the Chapter’s business and activities; organizes and presides over the Board of Directors meetings; oversees the Chapter’s general membership meetings and functions; and approves communications representing the Chapter to prospective members, the general membership, and the public at large. The Vice President acts in place of the President when the President is absent or unable to act; performs other duties as assigned by the President or the Board of Directors; and succeeds to the office of President. The Secretary acts as the recording officer, preparing and maintaining the minutes of the Board of Director’s meetings, the Bylaws, and Policies and Procedures Manual; distributes Board of Directors’ meeting minutes to Chapter members and NAPO National quarterly; maintains documentation of the Chapter’s official supplies and materials; and maintains the Chapter Organization Chart. The Treasurer is responsible for overseeing the funds and finances of the Chapter and filing all required governmental reports; prepares and submits a proposed budget to the Board of Directors; and prepares a monthly and annual financial report. The Programming Director plans, coordinates, and executes the Chapter’s general membership meetings, including the educational portion; and creates and posts a record of all general membership meetings. 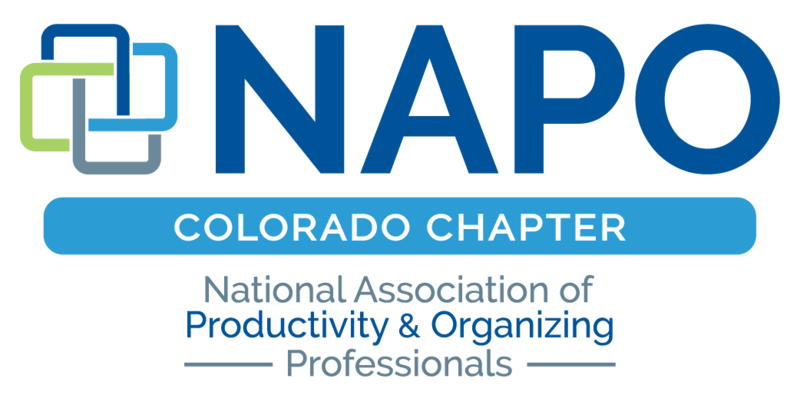 The Membership Director approves and processes all of the Chapter’s membership applications; and forwards any NAPO National membership applications to NAPO, Inc. The Communications and Technology Director oversees all duties related to the website, and/or other electronic forms of communications; participates in bi-monthly conference calls with national communications directors; maintains all current and updated content for website. The Marketing Director conveys the value of NAPO Colorado to the public and to chapter members via public relations efforts such as social media, press releases and promotional events and products; publicizes and assists the VP with GO (Get Organized) Month; tracks media coverage of the chapter/chapter members; helps with special events; and supervises social networking activities. The Director of Business Partners serves as liaison between the Board of Directors, Business Partner Members and professional members; and recruits and maintains Business Partner Memberships.